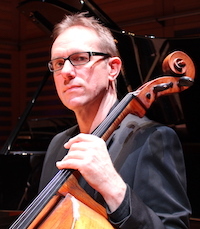 Tim Gill studied at Cambridge university, reading music (and meeting his future wife and eminent cellist Joely Koos), the Royal Academy of Music and the Banff Centre in Canada. In 1988 he was selected to play at the South Bank as part of the Park Lane Group concert series, and has since enjoyed a lifelong commitment to contemporary music. In 2001 he became principal cellist with the Royal Philharmonic Orchestra, and two years later was made principal with the London Sinfonietta, drawing critical acclaim for his solo performances of music by Stravinsky, Xenakis and Maxwell Davies. In 2011 he enjoyed a brief spell as principal with English National Opera, before returning the next year to the RPO. He now freelances in London, focussing on his solo and chamber music commitments while retaining his association with the London Sinfonietta. He has appeared throughout the world as a soloist, most recently at the BBC proms and at London’s Kings Place “Cello Unwrapped” series. Tim plays on a cello by Francesco Ruggeri, dated 1695, which used to belong to his childhood teacher Judy Bird. - The sound and the fury in concert: Ligeti’s ‘Chamber Concerto’ featuring cellist Tim Gill.